On a rainy evening I was staring at the microwave, thinking about how little I actually use it. That got me thinking about how much space I would have if it was gone. I’ve been struggling with food space, with an extra container for the flour, fruit, eggs and porridge that I move around the caravan, depending on what I’m doing. By taking out the microwave and making it a food cupboard I solve that problem! I’m aiming to just use solar power which means I can’t use the microwave anyway. The microwave takes too much power and I need to be plugged into a campground power supply to use it. Learn how little power I can use here. It took me a while to figure out how to get the microwave out. It’s all very prettily put together with no obvious screws and I had a few false starts. I eventually learnt that the microwave framing just required pulling off. Then I learnt that I needed a thinner handle on my screw driver to take off the wooden edging above the microwave. It’s surprisingly heavy. I’ve been overly cautious with what heavy items I have in the caravan. I’m sure taking the microwave out has deducted a good amount of weight. The microwave sat over the tyres, which is better for the weight distribution and I could safely have the bulky food items permanently stay there. It makes me wonder how heavy the fridge and stove are. I then found that the microwave plug was still a UK plug! 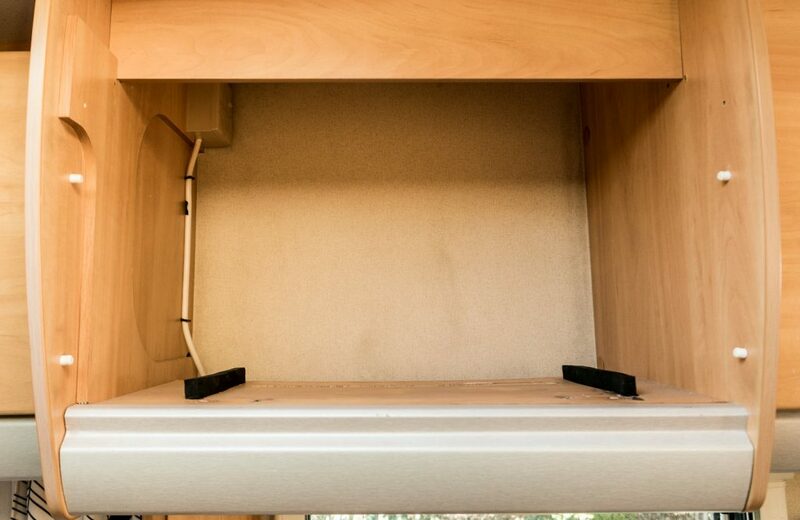 Which does makes sense to run the UK microwave in my UK Sterling caravan. There is an extra wooden platform under the microwave that I wanted to take out, but there is a screw that is stuck. Guess I’ll be leaving the platform where it is for now. I went on a trip to Kmart and purchase a weaved basket and wooden box to fit the new space. I’ve painted the basket white to offset the wood and lighten the area. 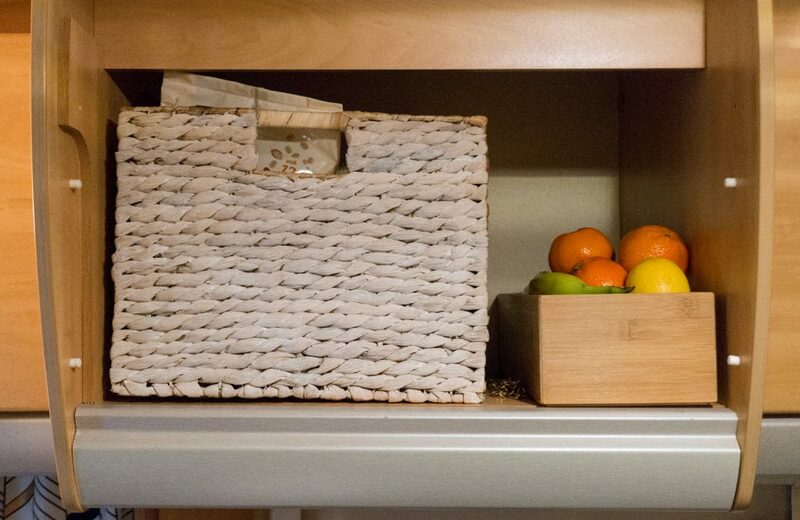 The basket now holds my bulk food items and the box is for the fruit. When I travel I currently chain the basket to the platform and move the box to a more secure area. I’ll eventually screw the box onto the platform and want to come up with a better idea for securing the basket. I’m already happy that I took the microwave out. It really was a waste of space. Now most of my caravan cupboards are for food! 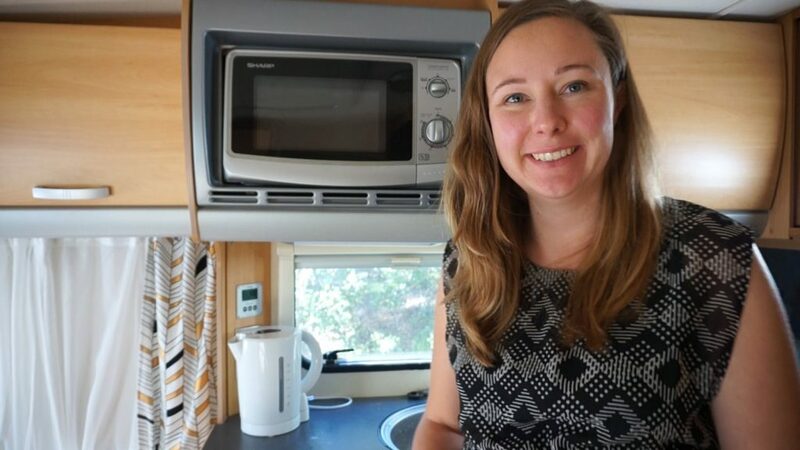 This is the second interior update to the caravan. My first update was the caravan curtains and I plan to update the sofa fabric soon. Would you need a microwave? Do you have any suggestions for making the area work better? I’d love to hear in the comments below.